Combine all ingredients except oil and salt and pepper in the blender and process until smooth. Add the olive oil slowly so it blends into the soup. Season to taste with salt and pepper. Refrigerate for at least 4 hours. Four hours before serving chill small glass bowls or martini glasses. When ready to serve: Pour the soup into the bowls and garnish each one with some diced cucumber, a few drops of hot sauce and olive oil. Serve immediately. This may be made through step 2, covered and refrigerated for up to 2 days in advance. Thin out the soup with a bit of stock, if necessary. 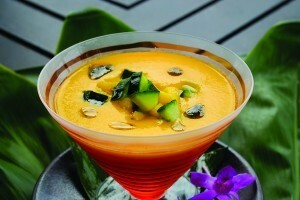 The thickness of the soup will be based on how ripe the mangoes are. Since there is little liquid added, other than the vegetables, the riper the mangoes the better.